Sleep makes everything feel better and when it doesn’t come easily or is broken, it can be stressful and exhausting. This means no electronics, gory videos or tv programmes and a positive attitude to relaxing. Try listening to a meditation or relaxation CD, no caffeine or alcohol just before bed and this will reduce your stress levels and get your body into a calm state ready for sleeping. Also it’s not a good idea to eat before you go to bed. Leave at least 3 hours since your evening meal to avoid your digestive processes keeping you awake. And if you drink caffeinated drinks, research shows that consumption within six hours of bedtime can have significant disruptive effects on sleep. On a physical level try a warm (not hot) bath with lavender oil, light some candles and have a calming cup of herbal tea. You could try calming your beta brain waves and improving Alpha activity. Alpha waves are the ‘frequency bridge’ between our conscious thinking (Beta) and subconscious (Theta) mind. In a state of stress, a phenomenon called ‘Alpha blocking’ can occur which involves excessive Beta activity and little Alpha activity. Now obviously we are all different, but ensuring your bedroom is quiet and dark and you are comfortable is a top priority. That means no restricting nightwear, the right temperature and no exercise within three hours of bedtime. Check your medication with your doctor as certain prescription medications – such as steroids, bronchodilators (used for asthma) and diuretics – can cause insomnia. Try Heart Math to reduce the negative impact of stress and build your resilience. Simple tense and releasing the muscles is a good yoga practice that also helps you relax. Essentially, this involves ensuring that only the bed is associated with sleeping. So, patients are advised against having naps, to go to bed when they feel sleepy, to get up again within 20 minutes if they haven’t fallen asleep, to do something relaxing until they feel drowsy and then try again but to get up once more if they still fail to fall asleep. There is also a growing body of evidence that suggests electromagnetic radiation from mobile phones and wireless internet connections (wi-fi) can interfere with melatonin production. For example, in one small study, melatonin levels were 44 per cent lower at 2 a.m in those exposed to mobile phone signals, compared to those who weren’t. Recent research has identified that signals can affect you up to 5 metres away and in many homes bedrooms are above living rooms and often therefore digital wi-fi routers. So it might be worth turning off your mobile and any wi-fi routers at night to see if this improves your quality of sleep. Keep artificial light to a minimum in the bedroom because being exposed to bright light can inhibit production of the sleep hormone melatonin, which peaks at around 1 a.m.
Fluorescent bulbs and light-emitting diodes (LEDs) have taken over lighting because they are more energy efficient and can provide better lighting than incandescent bulbs. But while these bulbs are helpful in many ways, they can also have a negative effect on sleep. They are found in everything from task lighting to televisions to smartphones, so pay attention to your evening use of light and technology. You can buy melatonin as an over-the-counter medicine in the United States, or on prescription in the UK. Several minerals and vitamins are also involved in getting a good night’s sleep. Calcium and particularly magnesium are calming and aid muscle relaxation. Being highly stressed or eating a lot of sugar lowers levels of magnesium, which is found in seeds, nuts, green vegetables and seafood; calcium is in these foods, too, and in dairy produce. Try supplementing 400mg of magnesium before bed. This can be especially helpful if you tend to wake up in the night with stiff muscles. It seems sleep can be so elusive, and if you are also suffering hormone imbalance then you may find that progesterone – which is a natural relaxant – can also help with this as well as those pesky night sweats. 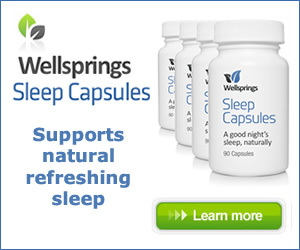 The capsules can help to relax the body and mind and support the body’s own natural sleep mechanisms.